Today, friday 2014-06-13, I would activate EA2/BI-055 Ganguren, near Bilbao, trying to make a summit to summit QSO with Hans who was as VK/PB2T/P at VK4/SE-112 Beerburrum. Yesterday night I set the FT-857 -for having a bit more power than with the FT-817- the linked dipole and the 8.2Ah LiFePo4, ready to give its juice. Early in the morning, and after a very short hiking, just to fill the "enter walking on the AZ" rule, I started to mount the antenna. Last week I changed the 2 BNC connectors of the 15 mtrs. RG-174 coax. Not so well. One of them fell without any resistance into the grass! a good start!. So in absence of any tools (It was going to be a short and easy activation...) I used the power of... well, hands and teeth to make a provisional connection to the antenna. The schedule time was arriving quick, but at 05:25 UTC I had all ready to transmit. 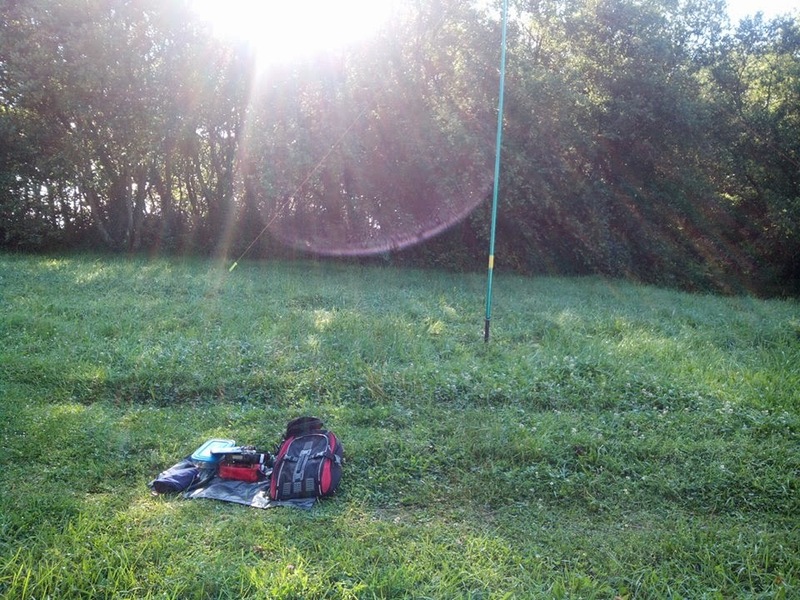 Being so early in the morning, the grass was full of water, even the temperature was of more than 26C (strange thing here at the BC) Fortunately, I've carried a big plastic bag, given by Marcial EA2BDS, which made a good working "platform". And then, it all started. Before Hans appeared, Gerard VK2IO and Andrew VK2UH made the first 14 mhz VK QSOs. It was promising... Just 2 minutes later, Hans and I achieved the 2nd VK-EA S2S QSO. Not splendid signals, but enough. The first early morning EU chasers started calling. Between some of the usuals, more VK OMs were coming: VK3AFW, VK2DAG, and later on 14.280 SSB, again VK3AFW, VK2IO and VK2UH, VK3WE, VK5PAS... ufff... unbelievable. And just for ending, Kenneth K6HPX/P at W7A/AW-057 with signals of 59+9 for my 2nd USA S2S QSO and Kurt HB9AFI/P at HB/VD-023, what a panorama! Just 1 hour and a half to make about 40 QSOs with S2S QSOs on 3 continents. As some advertisement says "I'm lovin' it!" Yes MIkel, and you are there again this morning, 18th June. We worked at 0542z on 14.062 MHz. I was able to make contact with you via back scatter by pointing my beam east, there no no direct path. Hi Phil, thank you, I did it again with Ian, but yours was harder to make indeed!